The other pastel paper that I discovered that I could use with acrylics was the Pastelmat paper as it has a water resistant surface. I decided to try it out with this lovely flower. It bit different to the Colourfix Suede paper but I also like the way the paint goes on - seems to go on smoother. 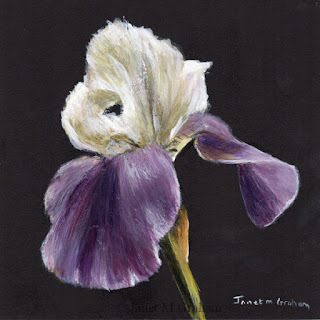 Iris No 2 measures 5 x 5 inches and is painted on 360gsm Pastelmat paper. 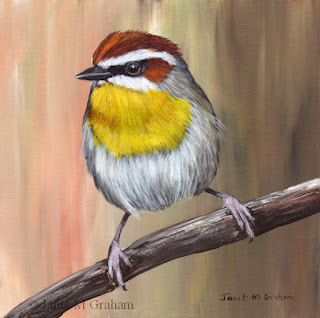 Many thanks to Kathy Throop for the reference photo. 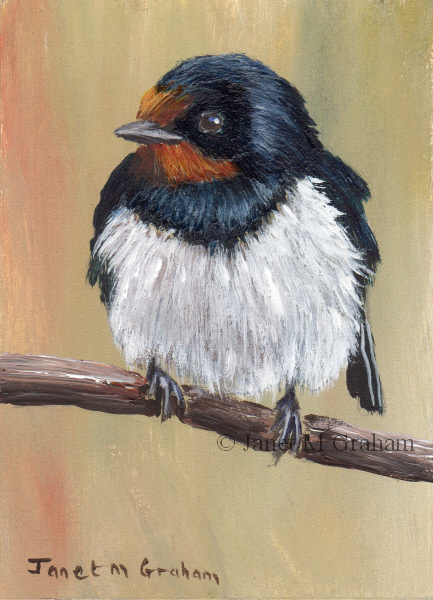 I couldn't resist painting this one - just love its colours and pose. Rufous Capped Warbler No 2 measures 5 x 5 inches and is painted on Colourfix 500gsm Suede Paper. 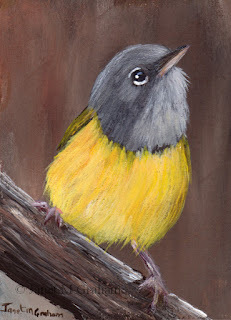 And for my next one, I paint this cute little bird. 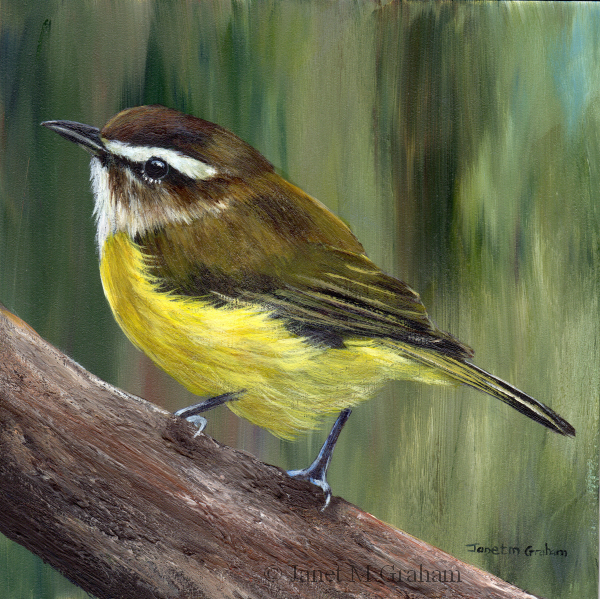 Macgillivray's Warbler are found in Western United States, West Canada and migrate back to Central America in autumn. They measure around 10 - 15 cm in length and weigh between 9 - 13 grams. Macgillivray's Warbler measures 2.5 x 3.5 inches and is painted on 300gsm smooth Arches watercolour paper. I love the pose of this one. Really pleased with how it turned out. 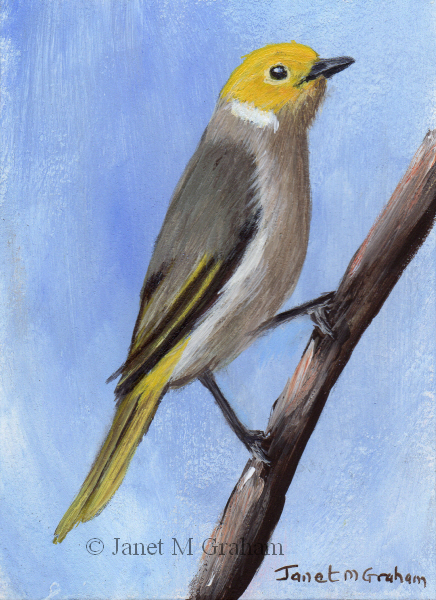 White Plumed Honeyeaters are endemic to mainland Australia. They measure around 15 - 17 cm in length and weigh on average 19 grams. White Plumed Honeyeater measures 2.5 x 3.5 inches and is painted on 300gsm smooth Arches watercolour paper. I decided to paint a flower for a change. Originally I was going to have the flower against the white of the paper but after I had finished painting it, I decide it need a background colour. So decided do then wash so that had more watercolour effect. Really pleased with how it turned out. 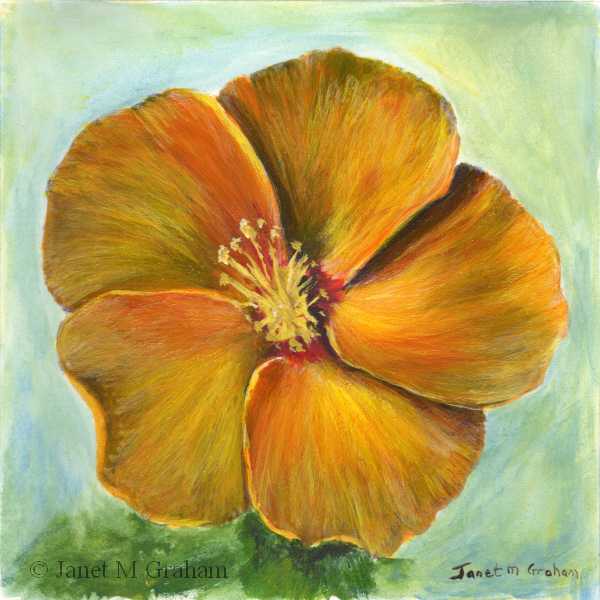 I used quite a few glazes to get the depth to the petals. Hibiscus measures 6 x 6 inches and is painted on 300gsm smooth Arches watercolour paper. 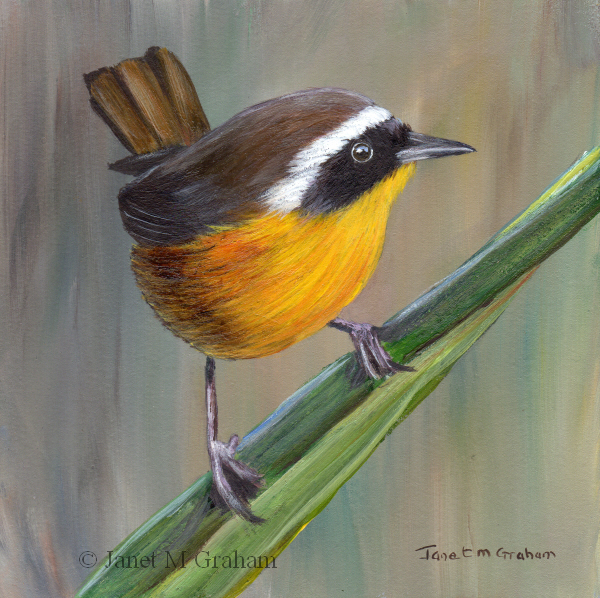 Common Yellowthroat No 2 measures 5 x 5 inches and is painted on Colourfix 500gsm Suede Paper. Many thanks to Kira for the reference photo. I decided to paint this one also on the Colourfix Suede paper. Really love how it turned out. 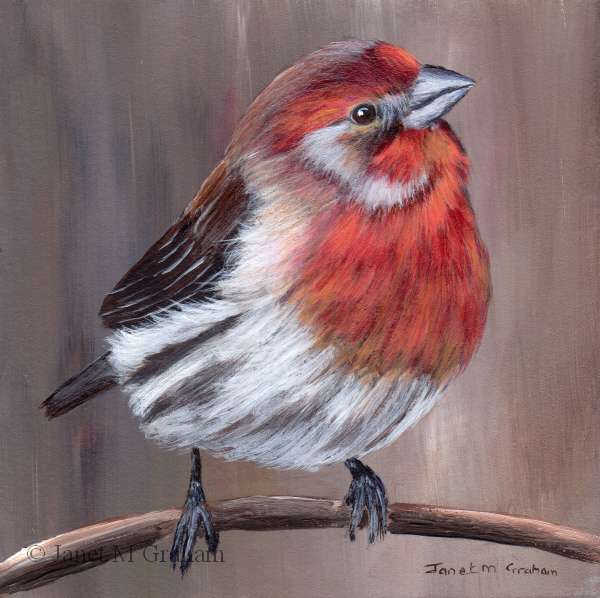 House Finch measures 5 x 5 inches and is painted on Colourfix Suede paper. I had a thought the other day that the pastel paper that I had left over from my days working in pastel would be suitable for colour pencils. So I pulled it all out and discovered something interesting that I hadn't realised - the surface is suitable for acrylics. I was curious to try out a different surface so decided to first try out the Colourfix Suede paper with acrylics. 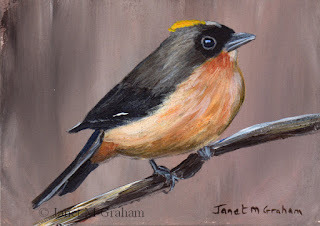 I absolutely love this paper for acrylics - it is hard to explain but the paint just slides on and it is easier to paint detail. Some information on the Colourfix Suede paper - the base paper is a 500gsm hot press watercolour paper and it is an archival quality surface suitable for use with a range of mediums including acrylics. 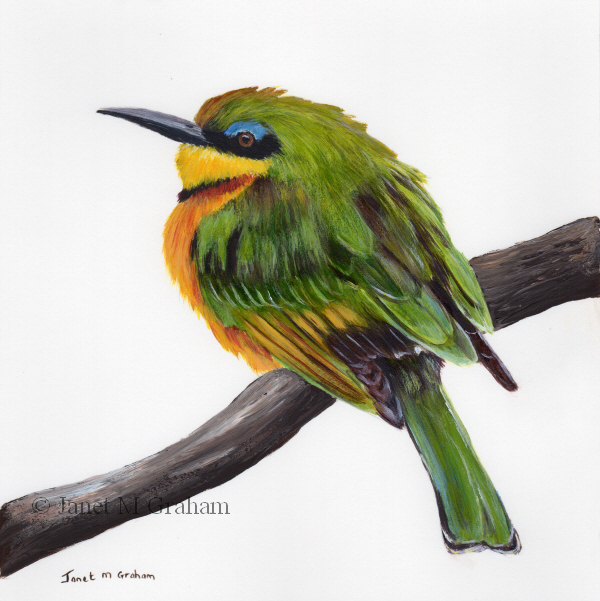 So here is the painting I did on this paper. Siskin measures 5 x 5 inches and is painted on Colourfix 500gsm Suede Paper. Really pleased with how this one turned out - everything just worked. Barn Swallows are found in Europe, Asia, Africa and the Americas. It measures between 17 - 19 cm in length and weighs between 16 - 22 grams. Barn Swallow measures 2.5 x 3.5 inches and is painted on 300gsm smooth Arches watercolour paper. 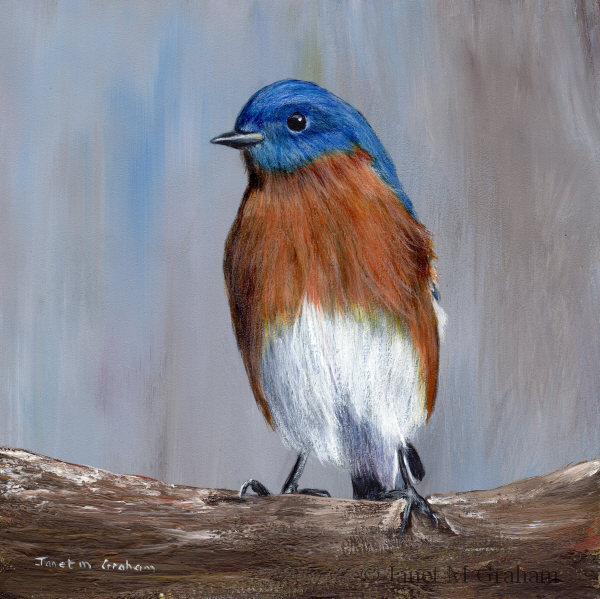 Love the blue tail feathers of this one. The Striped Kingfisher is found in Sub - Saharan Africa. It measures around 16 - 18 cm in length. 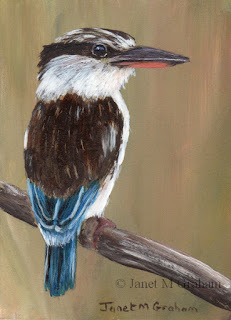 Striped Kingfisher measures 2.5 x 3.5 inches and is painted on 300gsm smooth Arches watercolour paper. I was drawn to the different angle this one is perched on the branch. 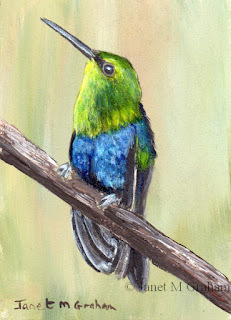 The Fork Tailed Woodnymph is a species of hummingbird found in South America. It also known as a Common Woodnymph. Fork Tailed Woodnymph measures 2.5 x 3.5 inches and is painted on 300gsm smooth Arches watercolour paper. I took this reference photo for this one a few years back at Sydney's Taranga Zoo - really pleased with how it turned out. 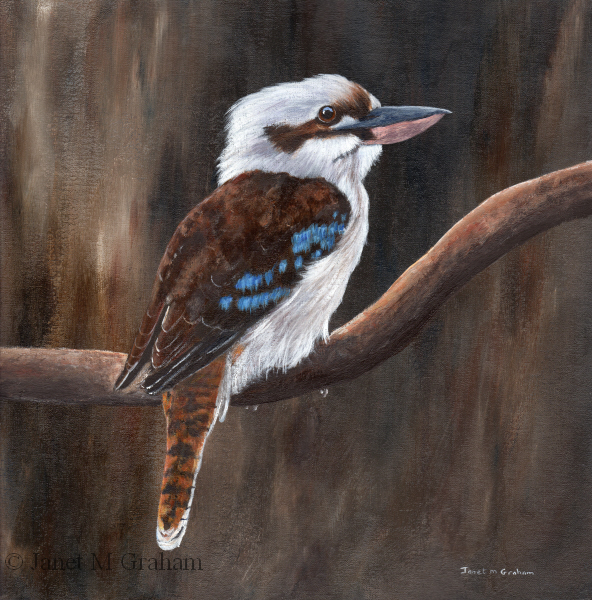 Laughing Kookaburra measures 12 x 12 inches and is painted on loose unstretched Fredrix watercolour canvas. Love the angle this one is perched on the branch. Really pleased with how it turned out. I haven't painted a tiger in ages and I love this ones close up profile. I used quite a few layers to get the depth to the fur and I am really pleased with the final painting. 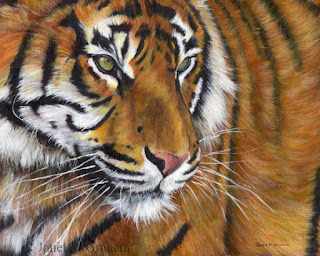 Tiger measures 10 x 8 inches and is painted on loose unstretched Fredrix canvas. And I couldn't resist painting this one - really pleased with out it turned out. 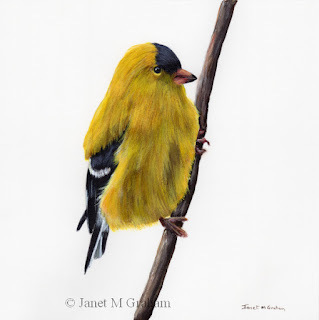 American Goldfinch measures 8 x 8 inches and is painted on 300gsm smooth Arches watercolour paper. Many thanks to Debra Underwood for the reference photo. And the next one is this little guy. Lesser Goldfinches are found in Western United States through to South America. They are a very small songbird measuring around 9 - 12 cm in length. 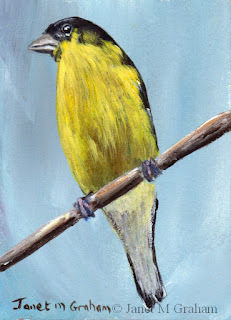 Lesser Goldfinch measures 2.5 x 3.5 inches and is painted on 300gsm smooth Arches watercolour paper. 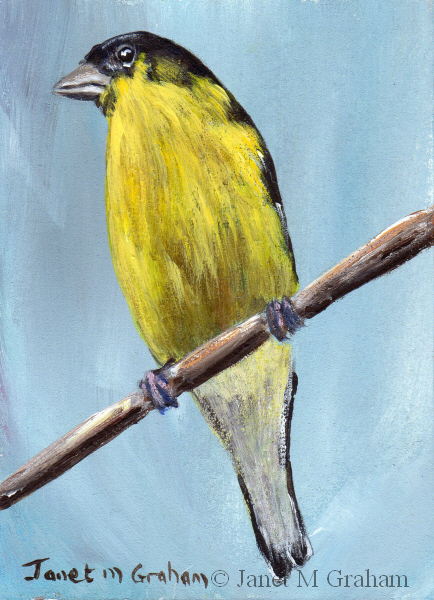 I seemed to be on a yellow bird painting spree this week - it one of my favourite colours to paint so I am bit drawn to them. This is the first one. 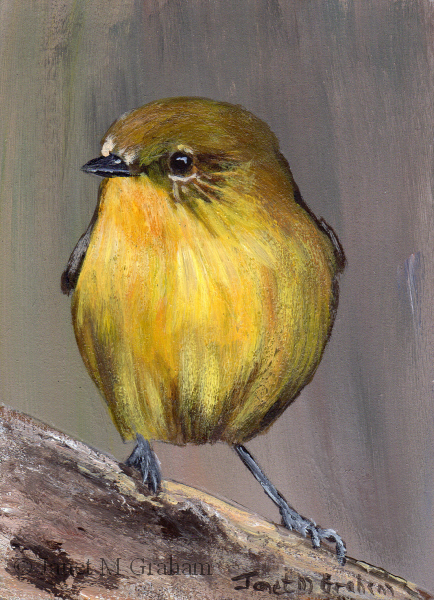 Yellow Thornbill measures 2.5 x 3.5 inches and is painted on 300gsm smooth Arches watercolour paper. I love how this in is perched on the branch..
Eastern Bluebird measures 6 x 6 inches and is painted on Ampersand Gessobord panel. Love the colours of these birds. Really please with the final painting. Little Bee- Eater measures 8 x 8 inches and is painted on 300gsm smooth Arches watercolour paper. 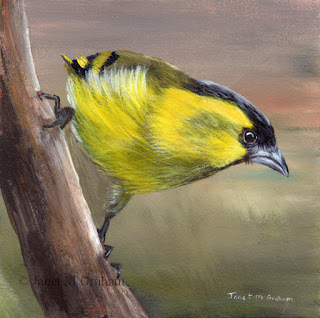 Black Goggled Tanagers are found Brazil, Paraguay and Argentina. Steller's Jays are found in Western North America. They are a large songbird measuring between 30 - 34 cm in length and weigh between 100 - 140 grams. 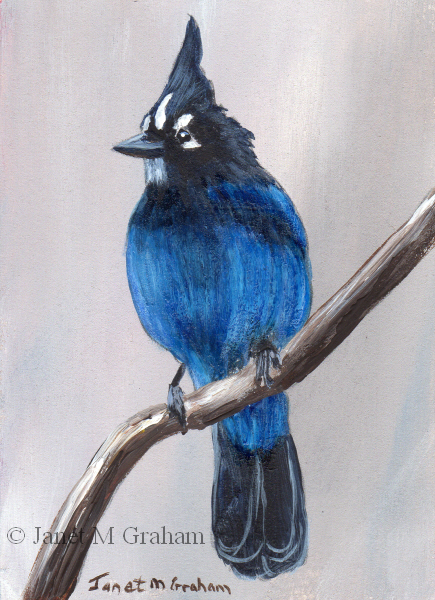 Steller's Jay measures 2.5 x 3.5 inches and is painted on 300gsm smooth Arches watercolour paper. 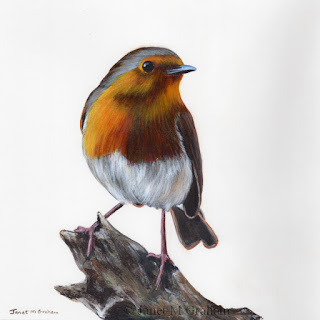 Robin No 10 measures 8 x 8 inches and is painted on 300gsm smooth Arches watercolour paper. Many thanks to Pixelbloke for the reference photo. 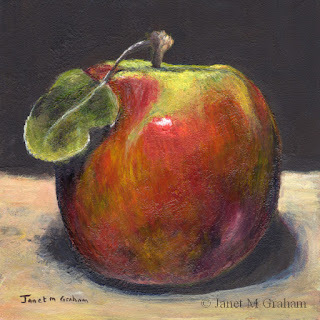 This is my favourite apple variety to eat and as this one still had a leaf attached to it I decided do a painting of it before I eat it. 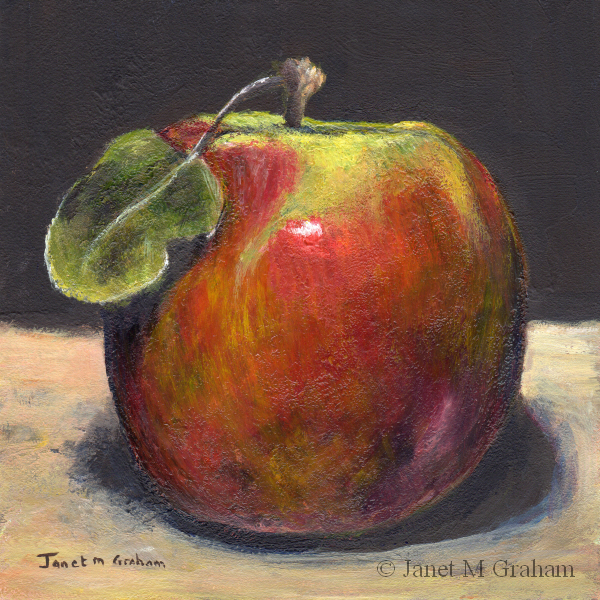 Pink Lady measures 5 x 5 inches and is painted on Ampersand Gessobord Panel.